Gain access to all amenities within the Monon Community Center. Get the HAPPiFEET app on the Google Play store or at the App Store. Looking for a before and afterschool program for your child(ren)? Look no further! Find out what each of our parks has to offer! Summer Program Guide Available Online! This summer we're offering 850+ recreation programs. Explore nature, creative arts, wellness and more! Registration opens April 1. Stay up-to-date on all things Carmel Clay Parks & Recreation! We serve the community, develop existing resources and create a sustainable future. Video Play Button Hear about our ongoing commitment to our community. 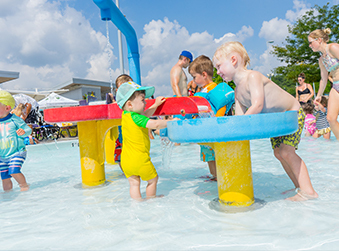 We manage and maintain more than 500 park acres and numerous recreation facilities, including the Monon Community Center and The Waterpark. In addition, we have partnered with Carmel Clay Schools to establish Extended School Enrichment (ESE), a before and after-school care program for K-6 students located at all 11 Carmel elementary schools. The Summer Camp Series is a component of ESE that offers 12 different summer camps accommodating children ages 5-15. Monon Community Center Your one-stop shop for health and wellness. The Waterpark Your 3.5-acre aquatic experience. Extended School Enrichment A before and after-school program open to all children enrolled in K-6 with Carmel Clay Schools. Programs for Everyone! Offering recreation opportunities in sports, nature, enrichment, arts and crafts, and more. Summer Camp Series Offering all day and half-day camps with themes including art, theatre, sports, nature and science. Parks & Greenways Certified wildlife friendly and habitat friendly park system with 17 parks and greenways.